Sodium bicarbonate has been around a long, long time. Arm & Hammer began producing baking soda, which is 100 percent sodium bicarbonate, in New York in 1846, but thousands of years before that, ancient Egyptians used naturally occurring natron, a sodium carbonate/bicarbonate combo, for multiple purposes—including drying organs during the mummification process. Today, most of us keep a box of baking soda around the house. It makes baked goods rise, eliminates acid-induced odors in refrigerators, carpets, and litter boxes, and is a minimally abrasive “green” cleaning agent that can be used to scrub everything from sinks and dishes to fruits and vegetables. Baking soda also comes in handy if you ever have to deal with a small kitchen fire. (Sodium bicarbonate is a common agent in fire extinguishers.) If you don’t have an extinguisher within reach, just throw baking soda on the flames. In addition to these household applications, there are a number of health benefits of baking soda—including the treatment of two very serious and increasingly common health concerns chronic kidney disease and cancer. Bicarbonate is an alkaline substance naturally produced in the body that buffers acids and helps keep pH in check. In healthy people, minute adjustments in the acid-base balance are constantly being made. But this is not the case in the one in nine American adults who have chronic kidney disease. Most often caused by diabetes or hypertension, poorly functioning kidneys have a hard time removing acid from the body, and this often results in a condition known as metabolic acidosis. Predictably, affected patients usually have low serum levels of bicarbonate. Such patients are frequently recommended to eat a low-protein diet so they’ll have fewer acidic waste products to deal with. But why not take further steps to improve the acid-base balance? That’s exactly what British researchers did. They treated patients with advanced kidney disease and metabolic acidosis with oral sodium bicarbonate in conjunction with their usual treatment for two years. What a difference it made! It slowed the rate of decline in kidney function by two-thirds, and just 6.5 percent of the patients treated with sodium bicarbonate required dialysis by the end of the study, compared to 33 percent in a control group. Positive results were also seen in a five-year, placebo-controlled trial involving patients with hypertensive nephropathy (kidney disease caused by hypertension). Daily doses of oral sodium bicarbonate, taken along with the usual blood pressure–lowering drugs, significantly slowed the decline of glomerular filtration rate (GFR), a measurement considered to be the best indicator of kidney function. Chronic kidney disease is a serious condition, and I’m not suggesting that you start taking Arm & Hammer baking soda to treat it. I do, however, urge you to discuss this with your physician and encourage him to look into this promising therapy, which can slow the progression of this devastating disease. Baking Soda as a Cancer Treatment? 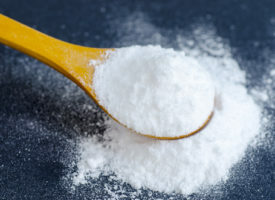 Sodium bicarbonate also has a role in cancer treatment, as Mark McCarty, a researcher with whom I’ve worked for decades, and I discuss in an article published a few years ago in the peer-reviewed journal Alternative Medicine Review. Tumors tend to thrive in an acidic environment. This is due in part to what is known as the “Warburg effect.” In the 1920s, Nobel laureate Otto Warburg theorized that, unlike healthy cells, cancer cells preferentially generate energy from glucose via an anaerobic process called glycolysis, which results in the formation of lactic acid. His basic premise and his belief that this phenomenon drives metastasis have proven correct. The extracellular space (the area outside a cell) of cancer cells is slightly acidic, and the degree of acidity tends to correlate with tumor aggressiveness. Decreasing tumor acidity could reduce cancer invasiveness and metastatic capacity. This is a likely reason why an alkaline, plant-based diet has been shown to improve cancer outcomes. However, we focused on more direct strategies, and the simplest of them is treatment with sodium bicarbonate. Sodium bicarbonate has a plethora of other health-related uses. Most over-the-counter antacids, such as Alka-Seltzer, Tums, and Rolaids, contain some form of bicarbonate. But a more cost-effective way to relieve occasional heartburn and indigestion is to drink half a teaspoon of baking soda dissolved in a half-cup of water. Baking soda also has a number of dermatological applications. British researchers found that adding one-half cup to bathwater soothes itchiness and irritation in patients with psoriasis. A paste made of baking soda mixed with a little water and dabbed on sunburn, insect bites, allergic rashes, and skin exposed to poison oak/ivy reduces discomfort. That same paste also makes a nice, gentle exfoliant. Baking soda can be used as a natural deodorant as well. Simply mix about a teaspoon with enough water to create a milky liquid, and rub it on your feet and underarms. Baking soda is a popular ingredient in toothpastes and mouthwashes since it has been shown to enhance plaque removal. Of course, you could just dip your toothbrush in baking soda, but due to its abrasive qualities, it may wear down enamel over time. Therefore, I recommend going with the commercial products. Finally, sodium bicarbonate may be a boon for athletes. When taken before intense exercise, it buffers the lactic acid that builds up in hard-working muscles, delays fatigue, and enhances athletic performance. Sodium bicarbonate is no stranger to conventional medicine, as it’s routinely given to correct acidosis. 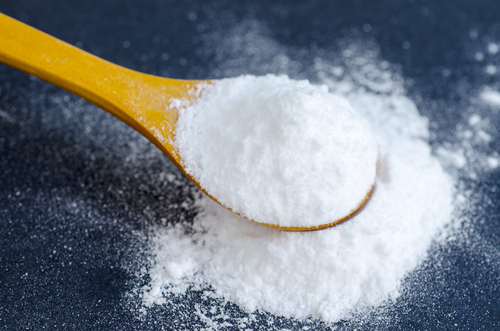 Few physicians, however, seem to be aware of the uses for baking soda I’ve discussed here, which could save the lives of millions and improve the quality of life of hundreds of millions more—at a cost of pennies a day. If you have kidney disease, do not begin baking soda therapy on your own. Discuss it with your physician first. The protocol for patients with cancer is 12 g (2 rounded teaspoons) mixed in 2 cups water, along with a low-cal sweetener of your choice. (It’s quite salty tasting.) Sip this mixture over the course of an hour or two and repeat for a total of three times a day. For occasional stomach upset, stir half a teaspoon of baking soda into half a cup of water and drink it an hour or two after meals. Safety: Topical use of baking soda is safe and nontoxic. Oral use is also safe, provided you do not exceed the recommended doses, as this could upset the body’s acid-base balance. Larger amounts can cause temporary nausea and diarrhea. Note: Although sodium bicarbonate contains quite a bit of sodium, it does not raise blood pressure. The hypertensive effect of salt (sodium chloride) comes from the combination of sodium and chloride.